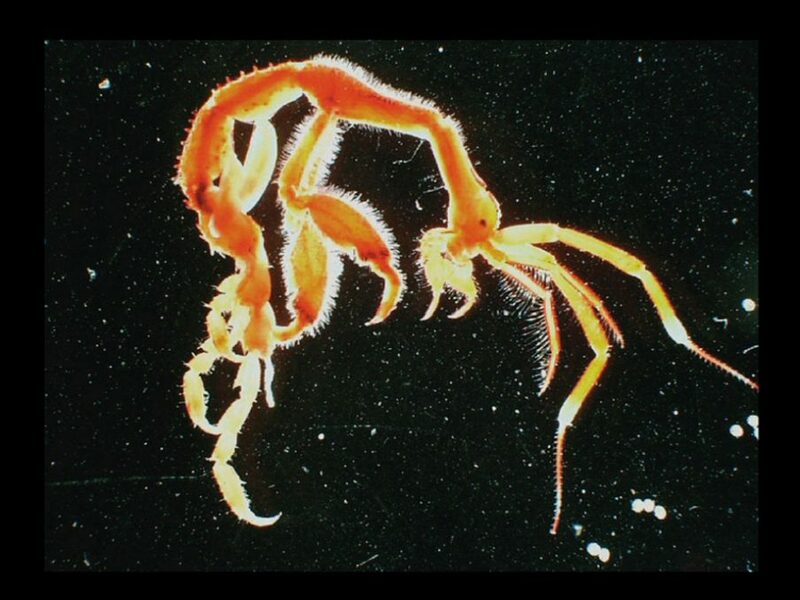 C. Mutica’s Hypothetical Journey (2005) tells the story of a ‘skeleton-shrimp’ named Caprella Mutica. A small marine organism, originally from Vladivostok that probably with ballast water spread throughout the world. This highly adaptable and opportunistic specie was first discovered in the Northeast Pacific in 1930 and was in 1999 detected in Norway. It is today being researched whether it is an invasive specie- a threat- or just an incidental newcomer. The video consists of a voiceover reciting a narrative, mapping out a hypothetical route C. Mutica possibly traveled to Norway. The story is based on current information that exists about the specie, as well as schedules and routes of ships carrying ballast water. The narrative has closer relations to a tale than to a scientific account, nevertheless based on scientific information. The specie is humanized through language and speculation by putting it into relatable narrative terms, familiar to fiction as much as nature documentaries. The problematics of invasive species, a result of globalization, is a very current one and is being dealt with from such different and sometimes contradictory perspectives as conservationists, politicians to environmental groups and scientists, which makes it complicated to orientate where the real issue lies. The imagery includes sampled clips from maritime nature documentaries, mixed with numerous images of ships, (sampled from ship spotting web sites) where the focus is on the name, the given identity of the ship and its continuous movement.